Loch Doon Castle is situated in East Ayrshire on the banks of Loch Doon, 9 miles southeast of Dalmellington village, 23 miles east of Ayr. Loch Doon Castle was built in the late 1200s on an island in the loch. A dam was built at Loch Doon in 1936 for a hydro electric system. This system uses water from a number of lochs in the area, with the Kendoon Power Station being 10 miles southeast. The castle is a great place to visit with two good hill walks that begin from the castle to the 1.401ft Wee Hill of Craigmulloch, as seen right, and the 1,716ft Craiglea. 1271 - the husband of Marjorie Countess of Carrick died on the 8th Crusade. Marjorie married Robert Bruce soon after. Robert Bruce held lands in south Scotland with his main castle being at Lochmaben, 8 miles east of Dumfries. The marriage of Robert and Marjorie led to them living at Turnberry Castle, 30 miles west of Loch Doon on the Ayrshire coast. They had five sons and five daughters at Turnberry, one being Robert the Bruce, the future king of Scotland. It is believed Loch Doon Castle was built at that time with 11 sides. 1296 – 1328 - during the First War of Scottish Independence, Loch Doon Castle was captured by the English when it was governed by Sir Gilbert de Carrick. 1314 - Robert the Bruce captured Loch Doon Castle during his campaign to remove English forces from Scotland. 1332 – 1357 - during the Second War of Scottish Independence, Loch Doon Castle was besieged by English forces in 1335. Troops loyal to David II (son of Robert the Bruce) managed to hold out. David II retained the throne of Scotland. 1400s, Loch Doon Castle was in the hands of the Kennedy family, largest landowners in southwest Scotland, relations of the Bruce's. 1446 - Loch Doon Castle was captured from the Kennedy's by William Douglas, 8th Earl of Douglas. 1510 - The castle was back under Kennedy control. 1511 - Loch Doon Castle was set on fire during an attack by men of William Crauford of Lefnoris. 1500s - Loch Doon Castle fell into a ruin. Some reports state King James V of Scotland may have had the castle destroyed as he set about reducing the power of large landowners. The king had been advised - some landowners were so powerful, they had desires of becoming king of Scotland themselves. 1823 - six dug out canoes were found close to the castle gate, with one having a Viking battle-axe. The axe can be seen in the Kirkudbright Museum. The Hunterian Museum in Glasgow holds two of the boats. 1936 - A dam was built at Loch Doon raising the water level. The castle was moved to the west bank of the loch at that time. 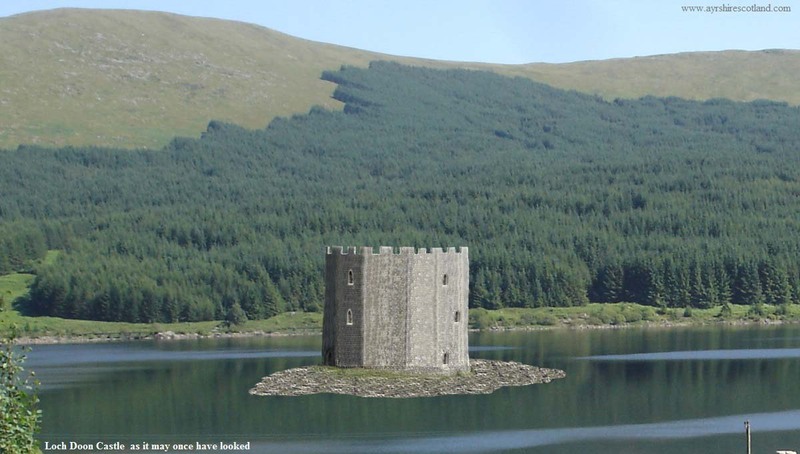 The image right is of what Loch Doon Castle may have looked like when it was on the island in the loch. Large Image.